ANTWERP, Belgium--(BUSINESS WIRE)--Monsanto Belgium has this year again been recognised in the top ten best places to work in Belgium. 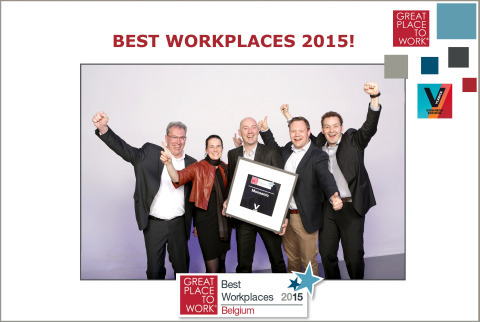 Monsanto was awarded 6th place in the category ‘companies with more than 500 employees’ at the ‘Best Workplaces 2015’ award ceremony held on Tuesday 10th March, in Brussels, Belgium. The awards are part of an annual ranking of businesses by the Great Place to Work Institute in partnership with the Vlerick Business School. Monsanto credits this recognition to human resources (HR) policies that strongly focus on the development and progress of employees. These policies have helped to foster an attractive work environment, and Monsanto Belgium is proud that on average, employees at the Antwerp site have been with the company for 20 years. The annual ranking of ‘Best Workplaces’ is determined thorough an independent analysis of a company’s culture and HR policies, as well as employee interviews. Building on the three company values – to work together, to inspire and to guide – Monsanto has built a strong HR policy that supports its employees in designing their own successful careers within the company. Each employee outlines his or her goals and future aspirations within the organisation and with the support of management, works to build his or her own career plan. “At Monsanto, our employees are the CEO of their own career. Because our employees are responsible for their development in the organisation, we motivate them to think seriously about their future and to translate this into a concrete, individual development plan,” explains Luc Verstraete, HR Lead for Monsanto in Belgium. Monsanto Belgium is continuously looking for talented employees across a diverse range of backgrounds. Each year, the company offers approximately 40 traineeships across all departments for young workers, and participates in the ‘Summer Challenge’- an annual summer work experience placement for students in first year bachelor Industrial or Chemical Sciences. Monsanto Belgium also actively participates in programmes for job seekers from less advantaged backgrounds. Monsanto Belgium was one of the founding partners of the ‘SIRA initiative’—an initiative run by the vzw Scheikundige Industrie Regio Antwerpen and social partners—that seeks to place young job seekers without qualifications in placements in the chemical sector with a view to possible recruitment. Monsanto Belgium actively encourages employee involvement in local community and charity events such as the ‘Antwerp 10 miles’, the ‘Drakenbootfestival’, ‘Kom op tegen Kanker’ and ‘Bloed geven doet leven’. Monsanto is a sustainable agriculture company with more than 22,000 employees worldwide. We produce seeds for fruits, vegetables and key crops – such as corn, soybeans, and cotton – that help farmers have better harvests while using water and other important resources more efficiently. We work collaboratively to find sustainable solutions for soil health, help farmers use data to improve farming practices and conserve natural resources, and provide crop protection products to minimize damage from pests and disease. In Belgium, Monsanto has a chemical production site in Antwerp with over 750 employees as well as a Regulatory and Corporate Engagement office in Brussels. More information about Monsanto on http://discover.monsanto.com and http://monsanto.eu. Monsanto Belgium moved up to 6th place in the Great Place to Work Institute's annual survey of Belgium's biggest employers.